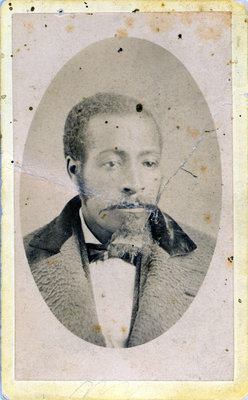 A very small cabinet card type photograph of an unidentified man, possibly a relative of the Bell - Sloman family. A handwritten entry on the reverse of the photograph indicates it was taken by John S. Thom, of Lucan. No date is provided, however, John S. Thom is known to have been a photographer in Lucan from 1877-1882. This cabinet card was in the possession of Iris Sloman Bell, of St. Catharines. Relatives of the Sloman - Bell family include former African American slaves who settled in Canada. John S. Thom is listed as a photographer in Lucan, Ontario from 1877-1882. Aside from photography, he also operated a general store and sold notions. It appears he then moved to Sarnia, Ont. and is listed as a photographer there from 1882-1900. He is also recorded as being a Sarnia bicycle dealer. Source: Phillips, Glen C. The Ontario photographers list (1851-1900). Sarnia: Iron Gate Publishing Co., 1990.